The Battle of Lissa (or the Battle of Vis) is known as the first major naval battle between ironclads. This day in 1866 marked one of the greatest naval victories of the Habsburgs. The Battle of Lissa is known as first major naval battle between ironclads, which replaced wooden sailing ships. The commander of the Habsburg Fleet was the famous Admiral von Tegetthoff. It is interesting to note that the Italian Fleet was considerably stronger than the Habsburg Fleet, and had more armored ships. The Italian Fleet was commanded by Carlo di Persano, who was also the minister of the Navy. 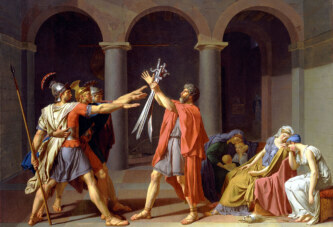 The Italians wanted to conquer the island of Vis. Admiral Persano left the port of Ancona and attacked the island, especially Komiža and Vis (towns which are now part of Croatia). They wanted to destroy the city’s fortifications, which didn’t happen, so their troops didn’t land on the island. The Habsburg Fleet was also sent to the island of Vis, and Admiral von Tegetthoff knew that the Italians were superior. Therefore, he used an interesting tactic – he formed his ships in a wedge, which then directly attacked Italian ships. The Italians didn’t have time to shoot, although they had more cannons. Tegethoff’s “Erzherzog Ferdinand Max” crashed into the broadside of the Italian “Re d’Italia”, which sank after that (there were 400 crew members). 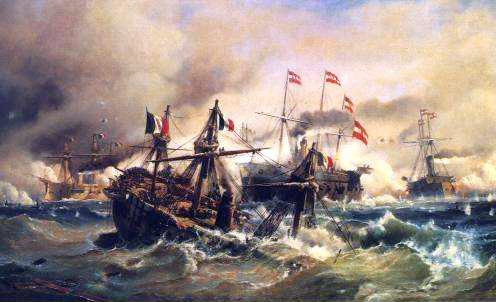 After the explosion of the Italian “Palestro”, the Italian Admiral ordered the withdrawal. The Habsburgs’ victory was complete. 620 members of the Italian Fleet died, and 38 of the Habsburg Fleet. It was one of the last great naval battles in history when such tactics was used. The Italians didn’t conquer the island of Vis.